Risk and reward are two sides of the same coin when it comes to trading the markets. In fact, taking on, managing and, where possible, eliminating risk is one of the primary functions of the global markets. While it’s true that a higher level of risk may often be associated with a higher reward, that scenario may only play out if the right decisions were made when we initially exposed ourselves to risk. Before we can decide what makes risk right or wrong upfront, we need to first understand more about risk itself. Some risks are common to everyone but not all risks are universally applied to all people. That’s because although we are all human beings, we are also individuals with our own needs, wants and goals and ambitions. These factors come together to help determine what we might think of as our circumstances, and in the markets, those circumstances will dictate how much risk it’s appropriate for us to take. Why Expose Yourself to Risk? The first thing to decide is why you want to take on risk in the first place, and what you want to achieve by doing so, In the context of the financial markets, the answer will most likely be around making money or increasing your capital, and to do so you’re willing to risk some of the money you currently have. That brings us to our first rule which is: you should never speculate with anything other than risk capital, or if you prefer, money that you can afford to lose. Now, of course, no one ever wants to lose money if they can help it, but what these rule states are that your trading capital should not be money that you are relying on to pay the bills. Speculation is not the same as investing, particularly when that speculation is undertaken through the use of leveraged products that don’t confer of the ownership of the underlying instrument to the speculator or trader. This brings us to our second rule of risk club: you need to understand the products that you trade. If you don’t understand the nature and mechanics of these products, then you won’t be able to accurately assess and quantify the risk they represent to your capital, and the most likely outcome in those circumstances is that you will lose a substantial amount of that money. Rule three combines the advice from rules one and two: scale your positions appropriately to reflect the size of your account. At Pepperstone, we recognise that clients have different sizes of trading deposits and in addition to our standard typical lot sizes of US$100,000, we also offer our clients the opportunity to trade in mini lots (1/10th of a standard lot) and micro lots (1/100th of a standard lot). The secret to successful trading is longevity and that longevity is achieved through capital preservation and growth. In order to preserve your capital, you need to be sensible about how you allocate it or portion it out. Many traders will allocate no more than one or two per cent of their capital to a particular trade. They will also limit the number of trades they have open at any one time, and set fixed P&L and or trading limits. For example, if they have three consecutive losing trades or if they lose $100, then they stop trading and cool off. Even the best traders can’t anticipate each and every risk that can present itself. However, established traders try to reduce or eliminate those risks that they can they identify. Some risks are hidden, or at least are not immediately apparent, particularly to new traders. One of these hidden risks is correlation. negative, in which a change in the price of instrument C results in a change in the opposite direction in the price of instrument D; or uncorrelated where the two instruments move independently of each other. Our fourth rule, therefore, is: don’t open multiple positions in different instruments without knowing how they are related. New traders often open multiple positions in the belief that they are diversifying or spreading their risk, when in fact the opposite may be true. That’s because all FX pairs and crosses are correlated to some degree through their relationship to the US dollar, which, as the global reserve currency, is the benchmark that all other FX prices are calculated from or referenced against. 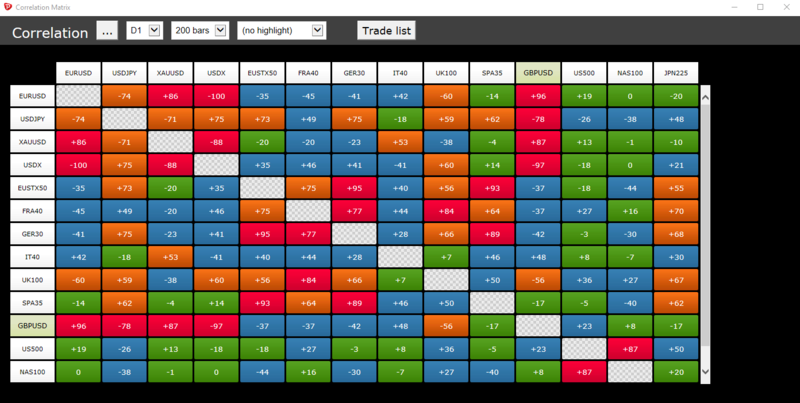 We offer our customers access to a correlation matrix as part of our Smart Trader Tools package for MT4 This allows you to visualise correlations between a wide variety of instruments and time frames, the matrix can be configured and filtered to suit your needs. You can find more information about our correlation matrix here. One of the biggest and most frequent mistakes new traders make is to ignore their own money management and stop loss rules that are designed to protect their capital and keep them in the ‘game’ for the longest possible time. Traders tend to convince themselves acting rationally in doing so, when in fact they’re not. There is a well-documented bias known as loss aversion, whereby traders won’t acknowledge a trade is wrong but rather than closing the position or letting a stop loss take effect as they should, they allow losing positions to remain open, perhaps moving stop losses further out or disregarding them altogether. So our fifth and final rule is: always use and respect stop losses. Traders will also need to think about their placement of stop losses, as clustering stops at round numbers, or at key support and resistance levels, can leave you vulnerable to stop hunting, whereby large traders push prices to these psychological levels, with the specific intention of flushing out and triggering the stops, creating the ensuing covering trades. If you can, avoid placing your stops at these type of levels, particularly in ranging, rather than trending markets. Understanding managing and limiting risk is an essential part of your journey to becoming an established trader. Often overlooked, it’s key to ensuring your longevity – and enjoyment – as a trader. By following our five simple rules for managing risk, you’ll be closer to minimising your losses and feel more confident in your planning. Pepperstone is authorised and regulated by the Australian Securities and Investment Commission (ASIC) and the Financial Conduct Authority (FCA). We take pride in our strong culture of regulation and compliance. The security of our client funds is of paramount importance. Pepperstone maintains segregated client accounts with National Australia Bank (Australia) and Barclays (UK).